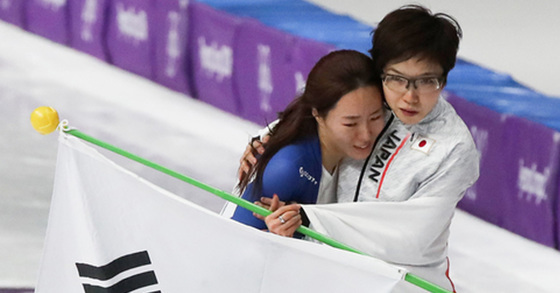 After Speed Skating Women’s 500m game on February 18, gold medalist Nao Kodaira and silver medalist Lee Sang-hwa smiled at each other. Kodaira, embracing Lee who burst into tears, said, “Great work” in Korean and the scene spread across the world to show the true Olympic spirit. The competition between the two had been fierce. Right before the Olympic games, Lee asked press media to stop comparing her to “that skater,” without directly mentioning Kodaira’s name. Kodaira, too, refrain herself from bringing Lee’s name. As the two had been in a rivalry relationship since they were teenagers, they strictly remained as competitors to each other before the game. However, the two found their friendship back as soon as the game was over. The two athletes confirmed their relationship at the press conference after the race by sharing an episode at Seoul World Cup three years ago. 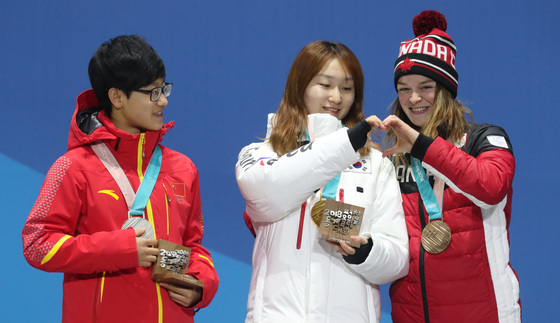 On the same day at Short Track 1,500m medal-awarding ceremony, another scene displayed athletes’ Olympic spirit when gold medalist Choi Min-jeong and bronze medalist Kim Boutin posed together to make a heart shape with their hands. Previously at the 500m final, Choi was disqualified from a silver for interfering Boutin. The controversial result led some of the Korean sports fans to Boutin’s social media account to leave hate comments, but the reconciliation shown at the ceremony was good enough to calm them down.